As a native of NYC, I’m no stranger to the natural wonders to be found there. In my time, I’ve filled quite a few notebooks with pleasant surprises…coyotes in Manhattan, Pine Voles in the Bronx, Red Salamanders on Staten Island, 1,000+ insect species, 13 herps, 250+ birds, red and gray fox on the grounds of the Bronx Zoo, and many more. New species have been discovered as well, but most have been small and secretive, such as the undescribed centipede recently found living in Central Park. But the existence of a sizable, gaudy frog that calls loudly each spring, living undetected within city limits, took the herpetological community very much by surprise. Northern Leopard Frogs, Rana (Lithobates) pipiens, have been recorded in NYC, but are rarely encountered today. The area also forms the northernmost limit of the range of the Southern Leopard Frog, R. pipiens; never common, it may now be locally extinct. It was during a search for Leopard Frogs in the NYC borough of Staten Island that a Rutgers’ University doctoral student noticed that the frog calls he was hearing were unique… similar to, yet different from, those of both Northern and Southern Frogs. Hybrids, perhaps? The “questionable” frogs were located and collected. Lab and genetics studies conducted over the past 2-3 years revealed that the animals were a species new to science. This revelation is especially surprising because Leopard Frogs have been well-studied in the Northeast. The NYS DEC has sought sighting reports for years, and the existence of a third native Leopard Frog was postulated as early as 1936. Yet the new frog remained “hidden in plain sight” until now. The research behind this exciting new discovery is described in the Journal of Molecular Phylogenetics and Evolution, linked below. The frog’s range has been described as entirely within “commuting distance of NYC” – maybe this fact will be used when it comes time to give the new frog a common and Latin name? The range is believed to extend from Putnam County, NY to Trenton, NJ, with its center at (or formerly at!) Yankee Stadium. Although not recorded near Yankee Stadium or in the Bronx, I suspect researchers will be haunting the Van Cortland and Pelham Bay Parks this year. I’ve found Leopard Frogs at these sites, long ago, and assumed they were Northerners, but now I wonder… (the new species seems impossible to distinguish by sight alone). The newly-described frog also lives in New Jersey’s Great Swamp. It was here, while on a childhood trip with the NY Herpetological Society, that I first saw Leopard Frogs breeding (I now wonder what species I was looking at….). The Great Swamp remains a magical place for me, and I’m planning another trip in a week or so. Please visit if you have the chance…you can read more about this area in the article below. Interestingly, the Eastern Gray Tree Frog, Hyla versicolor, another NYC resident, is also distinguished from a look-alike cousin, the Cope’s Gray Tree Frog, H. chrysoscelis, by voice alone…physically, they are identical. Depending upon the authority followed, 12-17 Leopard Frog species range from Canada to Central America. While superficially similar in appearance, most have unique habitat requirements, and their conservation needs vary greatly. The Chiracahua Leopard Frog, R. chiracahuensis, (which calls while submerged), is one of several that are quite rare; just this month (March, 2012), the federal government set aside 10,000 acres as protected habitat for this species (please see article below). This underlies the importance of using genetics and other techniques to identify unique populations and species. There is a reason why the newly- discovered Leopard Frog diverged from the 2 relatives with which it overlaps…its future may depend upon our understanding of that process. Please see the article below for information on other Leopard Frogs. Leopard Frogs can be good terrarium subjects, but tend to be high strung; spacious quarters are a necessity. Captive-bred animals, or those reared from tadpoles, do best as pets (Leopard Frogs should not be collected from the wild, and are protected by many states). They may be kept as I’ve described for Green Frogs in this article; please write in for more specific information. Hi, just a question, What have you found in Pelham bay park or Van Cortland?? ThanKs!!!!!!!! I just realized I may have missed your last post on Caudata.org…thx for posting here, my other readers will appreciate this as well. In the past, spotted salamanders, duskys, 2 lined and red-backs were at both sites. I’ve written to a contact who has recent experience there, and will send you a note when I hear back from him. If you’ve not read it John Kiernan’s The Natural History of NYC is a wonderful book…mostly for a historical perspective, but also some valuable insights as to what/where to look today. Really is priceless, in my opinion, for those of us growing up here. I went to Caleb Smith state park today,to see if i could find anything, and all i found were ticks[one was on me, scared!!] and fish, have you had any experiences there?? Sorry, I’ve not spent too much time there; please check carefully for ticks, and follow all precautions, – repellent, etc. Sad but a real concern…. Please don’t hesitate to write; it’s great to see your interest. Pound Ridge and the Great Swamp are both great places to visit. 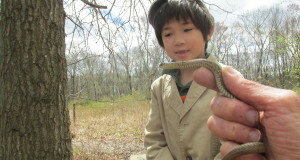 There’s a vernal pond in Pound Ridge, not far from the entrance, that hosts wood frogs, peepers, newts and sometimes marbled salamanders; larvae/eggs from all should be there now, perhaps frogs will still be calling. The pond is located on the road that veers off to the right after entering the main gate…but best to call ahead and get the exact location, as it’s been a few years since I visited; pond has a sign “Amphibian Breeding Site”. Many of NY’s native salamanders inhabit the park…duskys are sometimes found under rocks along various streams. There’s a nature center there as well, not always open so check beforehand. Please see this article for some more info on herps I’ve found there. The Great Swamp likely has an even greater diversity of species, but I’m not sure about the best ways to see them; it’s been many years. I believe there is now an extensive boardwalk system…perhaps if you call someone on staff can give you more specific info. Your nephew is so cute! But , isnt it too early for bullfrog tads? I thought they come out in like late june to august? Thanks so much…seeing his excitement and expressions is the best thing possible for me! Here in the NE bullfrog tads usually take 2 years to transform; they hibernate and so large ones can be found at almost any time. Adults do breed in June and later, so it is then that you’ll find the young-of-the year. Ahh.. i usually see them all year round here, but it didt occur to me that he may be catching them now, i usually catch them in summer! But sometimes in November i go to ALLEy Pond and feed them some bread! [because the ducks did not finish it] and your nephew has the 3 or 7 gallon critter keeper? because i would only use the 3 because the 7 makes it harder for the tads to get the food , and my filter ends up sucking it up!! But other than that i like the set up – reminds me of spongebob! Interesting…can you see the tadpoles coming to the bread?…I’ve had bullhead catfish do that, but not tadpoles! As for filters, for tadpoles I like an old fashioned corner filter that pulls water from the bottom, such as this one. Generally, flake food will remain in the tank; Small world filters are also fine, especially if tank will be getting frequent partial water changes. Sponge filters are good for toad, leopard frog and other small species. I use a lot of kale, dandelion and other greens (along with flakes) for bullfrog tads…not affected by filters and packs on the size. Algae tablets are another good option if you’re using a strong filter. Hi, my name is Sion. I live in south wales. In the area that I live in there is a pond which has this pond I want to study their food source and their water to understand how they’re living. I think that their food source is discarded egg shells so I want to know how they gain their nutrients from this food supply. Hi, I’m sorry I wasn’t clear. I am studying the life cycle of the toad, I am doing this by looking at the toads in a local pond. I want to do this by seeing what kind of food they eat and what type of habitat they live in etc. There are only tadpoles in the pond at the moment, I have collected samples of their food and their water, I want to analyse the samples but I am not sure what equipment to use and how I should use it? Thanks for clarifying. Test kits sold for use with fresh water aquarium fishes will allow you to test pH, hardness, ammonia, nitrates, nitrites, chlorine and other aspects of water quality, all of which should be useful in your work. See this kit as an example of one that allows for several tests; you may be able to get a similar one locally; each may also be sold individually (pH test kit, etc). As for food, the on only practical way to study this would seem to be to keep the tadpoles in an aquarium for a time. You likely have the Common Toad ( Bufo bufo) there; Natterjack Toads are limited to a small area in the north of Wales, I believe. They are known to eat algae, decaying plants and other organic detritus; they may take dead and decaying insects and other tadpoles as well. Would be interesting to see if they consume eggs, as I believe you mentioned. I just bought the API Freshwater Master Test Kit for £24 on Amazon is this a good price. That is more expensive than typical for here in the US, but shipping from here to the UK would raise your cost significantly. I just entered a science competition and they said my project sounds good and if I complete it they’ll give me a silver award. I need to know the dna structure of the tadpoles and the food they eat, so that I can see if they eat their old egg shells but I am not sure how to do it? Unfortunately, DNA work is beyond my abilities. It’s not something you would be able to do without the help of a museum or university based research lab. If your teacher has any such connections locally, that would be the way to go. I am concerned with the ponds by my house, when I went there today I saw that in one pond the tadpoles are flourishing and are doing fine but in the other all the tadpoles are dead apart from one or two who are close to death. I am not sure what is causing the death count and why the two ponds which are right next to each other have living tadpoles and dead ones? Mass deaths are usually the result of disease or a water quality problem. Most troubling of all diseases is Chytrid fungus infection, which is believed responsible for appx 200 amphibian extinctions in recent years. We still do not understand why it has exploded in this way, but biologists the world over are studying it. Please see this article. . Let your teacher know…it may be worth a call to your local environmental/wildlife agency. Water quality tests may or may not be helpful, but are worth trying. I have done some analysis and in the pond where I found the mass deaths was lots of spirogyra and the other pond I didn’t find any spirogyra. I think that this is causing the deaths but I do not know for certain but I think that the spirogyra is the cause. Thanks for the update. I’m not aware of any cases linking spirogyra to amphibian deaths; I’m not saying this is not possible, but unfortunately I can’t point you towards any relevant studies. Please let me know if you uncover any evidence. I think I have discovered a new species of Frog living in South Wales because of a tadpole living in a pond in the town of Cowbridge was about 2 inches long but it doesn’t match the descriptions of the common frog or toad tadpole, it is way too big. It looks similar to frog tadpoles but the size and colouration is all wrong and it is definitely not a newt tadpole either. Interesting, but please bear in mind that tadpoles of the same species can vary widely in size and coloration; herpetologists rely upon the arrangement of the teeth for ID, but these are rarely visible to the naked eye. I am not sure that if this is a mutation but I have found more similar tadpoles in that pond not quite that size but definitely the same colour. How would I be able to look at the teeth, my school will lend me microscopes but is that what I need. I’ve not tried, but I understand it’s a very complicated procedure; teethe are tiny and arranged in many rows – likely that dissection would be needed. There are not many field guides that include diagrams; here in the US, at least. I’m not sure that an ID can be made without an expert’s help. It might be useful to raise a few…once they transform, ID should be easier. Most tadpoles do well on a diet of tropical fish food flakes and kale, dandelion or similar greens. Place the greens in boiling or near-boiling water for 2 min or so before feeding, to break down cell walls (2 min in a typical micro wave works well). The big tadpoles are now frog-lets. The size of the frog-lets is incredible they are about twice the size of the other frog-lets which I have identified as the common frog. The other big tadpoles have the same outcome. The pattern on the big frog-lets is slightly different to the common ones and are slightly lighter in colour. Thanks for the feedback; please let me know when you have an ID. American Bullfrogs are established in the UK, but I;m not sure if they are in your area..tadpoles are 6-7 inches in length, huge compared to natives. Take a look at these pictures see if you can identify the frog-let. It is about 3 days old. One of my Biology teachers suggested that it might be a marsh frog(pelophylax ridibundus). put this in a search bar and look for yourself. I’m just wandering if you have seen those photos and if you have found out what it is. I just clicked on the link again, but the photos do not appear. Best to look at the frogs with a good field guide in hand, so that you can check important distinguishing features such as dorso-lateral skin ridges, arrangement of markings, extent of toe webbing etc…these small details are often necessary for ID, especially with small frogs, and are usually not clear or visible in standard photos. This is amazing! Im not sure how I missed this in the news, but thanks for the heads up. So cool to see a new species right in our backyard. Did you make your trip to go hunting for more of this species in the swamp? Im in Brooklyn and will definitely be keeping a closer eye out from now on. There has been unusual activity with frogs and toads here in Wales. It is the beginning of March where toads are normally everywhere but I have not seen any no spawn no movement at night whereas I have lots frog spawn in places where there is usually nothing such as the pond next door which never gets frog or toad spawn but this year there has been lots of frog spawn and there has been large clumps of frog spawn on the road aswell, naturally I transferred it to the nearest pond but still it’s very peculiar because I have seen no traces of frogs anywhere in March and February. I wonder if this has something to with large amount flooding we had last year or maybe it has been snow we got in January. I just don’t know, could you give me an insight? Very interesting, thank you. There are many factors that can influence how/when/where frogs breed, and we do not understand most of them very well. I recall a careful, 10 year study of several species here in the US that raised more questions than it answered…some years, when conditions seemed ideal 9to us! 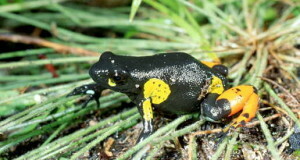 ), there was little breeding; in “bad” years many frogs/salamanders bred, etc…rain, pH chaNGES, A POOR SURVIVAL RATE YEARS BEFORE, changes in predation/disease of which we are unaware, internal biological clocks/circadian rhythms, – all and many more may play a role. Not directly on point, but I also recall a kangaroo reproduction study that established that, in order to understand their breeding cycle, one would need to analyze 100 years worth of info on rain, grass growth etc…anything less than that would give false results!! The types of questions you raise are critical to understanding the conservation needs of amphibs, especially as climate changes, etc…there is work being done in this area, but not enough. Are you familiar with this group, based in the UK? ; they may be keeping track of local conditions. here in South Wales there have been very strange patterns among the frogs in my area. They are reproducing at a much larger rate than ever before, there is frog spawn in lots of ponds which normally have nothing in them like my next door neighbour’s pond which normally has nothing in it accept snails but now there is large clumps of frog spawn there, also there has been some frog spawn on the roads aswell huge clumps of it naturally I moved them straight to the nearest pond but still it’s weird. What’s even more unusual is that it is now march but there is not sign of toads or toad spawn anywhere normally about this time of year they come in large numbers to various ponds but now nothing. I wonder if this is due too the flooding we had last year or the snow we got in January but those are just guesses can you offer an insight? I was at my local pond today and I noticed some strange behaviour amongst the tadpoles and toad-lets. There was this trapped toad-let amongst some mud and it was swarmed by tadpoles and I thought they were going to eat it, but actually they bit away the mud which allowed the toad to swim away. This could show signs of intelligence or relationships with the toad-lets.